You are here » frostvalley.org » Overnight Camp » Geronimo with Al at the Farm! Geronimo with Al at the Farm! Today we had an incredible day of programming. 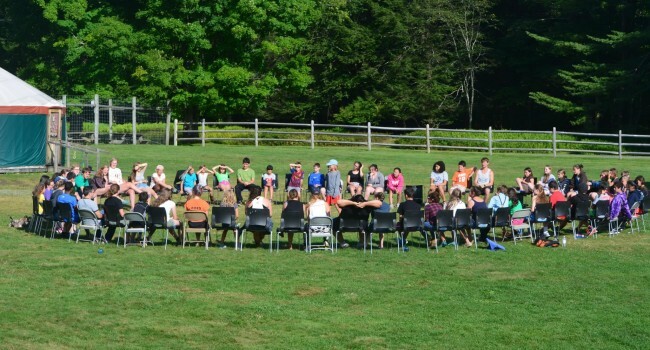 Campers got to choose between many different activities, which I want to share with you! On Wednesday, the staff celebrate ‘Wolf Shirt Wednesday’ by wearing wolf shirts. Today, the campers had the opportunity to make their own wolf shirts for the holiday, by using stencils and puffy fabric paint. Those shirts looked fabulous! Our program director, Alan, ran a program called ‘Being Old With Alan’ in this program, campers made walking sticks and worked on their raspy voices. Two of our counselors ran an activity called ‘Getting Messy!’ In this activity, counselors ran various games. The campers who won the games had the opportunity to cover the counselors in whip cream and chocolate syrup. By the end of the activity, they were covered. Finally, during Yurt Time, we got a visit from Al Filreis! Together, we played Geronimo. A game that celebrates campers differences and backgrounds, while simultaneously having a competitive twist. We ended our exciting day today with a riveting game of French Revolution in the woods. We can’t believe that we only have one full day left with the kids!